Good news for you! If you are “Accord Fan” and waiting for some bombastic models you will be pleased to read that All-New Accord Hybrid and Accord Plug-in Hybrid has been launched in Japan. Both of these Sedans are loaded with high-tech features. All New Accord Hybrid is powered by Sport Hybrid i-MMD system that is renowned as most fuel economical Powertrain in the world. Honda has built this Powertrain on its favorite Earth Dream Technology that plays a key role in making it fuel-efficient. This engine changes its modes according to the driving conditions and situations. EV: In EV Drive the engine runs on battery. In EV mode after full charging All new Accord Hybrid can travel up to 36 Km. Hybrid Drive: At acceleration, Sport Hybrid i-MMD uses gasoline engine to produce electricity. Engine Drive: For high speed, engine produces power directly from gasoline engine. You can switch to above mentioned driving modes according to your driving requirement and can save fuel/energy. According to rough estimate you can achieve fuel economy of 30 Km/L. 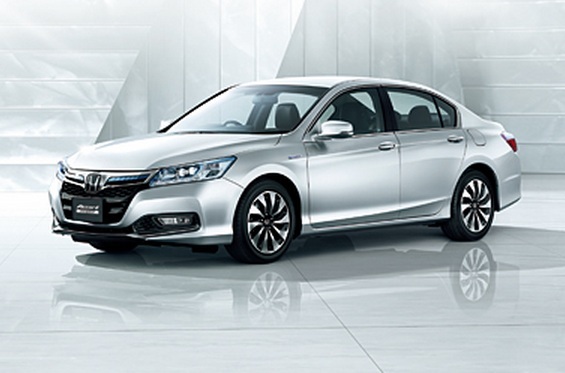 Accord Hybrid and Accord Plug-in Hybrid features stylish exterior. Honda has added all the possible features of Sedan. Front and rear sides are designed in a way to keep air flow in balance and to improve the aerodynamic performance so that maximum fuel economy can be achieved. “V Layout” has been used in its interior; this layout improves the comfort and interior space. All New Accord Hybrid and Accord Plug-in Hybrid-the two shining Sedans from the house of Honda are available now.